John Moses Browning was one of the 20th century’s most famous gun makers in the world. He was born in Utah on January 23, 1855 to Jonathan Browning and Elizabeth Clark. They belonged to the Mormon faith and had settled in Utah after the Mormon Exodus of 1847. Jonathan was a skilled gunsmith and repairman, and it was in his workshop that his son learnt the craft of gun making from an early age. Jonathan himself invented two repeating rifles before John’s birth. However, he did not patent either of these inventions and it is not known how many of each model he produced. John was highly influenced by his father’s skill and passion for design. John attended school for short periods but was mostly immersed in perfecting his craft. At the age of 18, he took over Jonathan’s business and begun to design his own guns. His first patented gun was a Single Shot Rifle; Jonathan was one of the witnesses at the patent application but died four months before the actual patent was granted to John. In the same year, John married Rachel Teresa Child. After his father’s death, John and his brothers went into business for themselves and soon had a thriving business. However, John was more interested in designing, and was dissatisfied with having to spend all of time in manufacturing. So in 1883, when a salesman from the “Winchester Repeating Arms Company” brought an offer to purchase the rights for producing his rifle from his company headquarters, John agreed and the deal was settled for $8000. Between then and 1902, John designed many more firearms for Winchester, each with a distinctive style. Not all of them made it past the design stage, but John kept designing new and unique guns. Many of the guns he produced for the Winchester Repeating Arms Company became bestsellers, such as the Lever Action Repeating Rifle, Lever Action Repeating Shotgun and Pump Action Shotgun. Despite his long running fruitful relationship with Winchester, John eventually took his designs abroad due to a royalty disagreement with Winchester over his latest design, a new long recoil operated semi automatic shotgun. John wanted to renegotiate the royalty structure to a per unit basis rather than a lump sum payment like he had been receiving earlier, as he considered this would be more beneficial to him. Winchester management refused to renegotiate and John took his business to Fabrique Nationale de Herstal of Belgium. The new gun was named “The Browning Auto-5” in his honor and was one of the 20th century’s best selling shotguns. 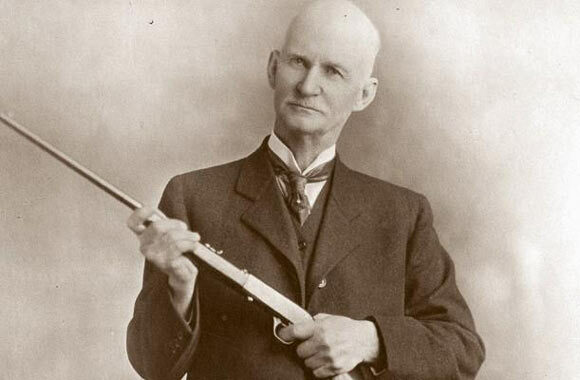 John Moses Browning was an untiring inventor and continued to work in his old age, rather than retiring. His last completed firearm was the Browning Superposed shotgun, one of the most well designed and stylish guns that he had produced in his life. It was highly priced but very popular and some variations of it continue to be manufactured to date, carried on by his son Val Browning after his father’s death. At the time of his death, in fact up until the very day, John Browning was working on a self loading pistol design in his son Val’s workshop when he died of heart failure at the age of 71 on November 26, 1926. Other than a large array of firearms, Browning produced a variety of cartridges. Several of his designs are still in production, close to a hundred years after his death. He was awarded with the John Scott Medal in 1905 and the Order of Leopold in 1914.